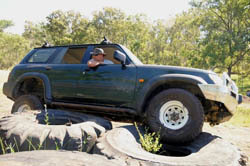 Jenowen Hills 4x4 Park has tracks from the moderate to extreme. The tracks were dry in most areas on our trip but could see issues if raining, so it is recommended to call the park manager before driving out for a report. It has a good area for comps and there is camping area available. The other members in the club gave the park the 2 thumbs up.